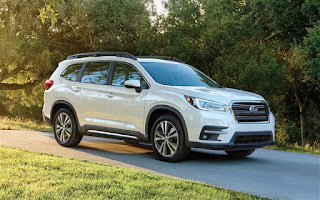 Subaru has made a return to the 3-row seat SUV market by introducing the all-new 2019 Subaru Ascent. The Ascent offers a simple, functional, and practical approach that is well suited for families looking for convenience in a well-appointed vehicle. In a market dominated by 6-cylinder engines, the Ascent offers an amply powered 260-hp, 2.4-liter turbocharged four-cylinder with a continuously variable transmission. The Ascent Base and Premium are EPA-rated at 23 mpg overall, and the more lavishly equipped, heavier Limited and Touring are rated at 22 mpg overall. The Base model can tow 2,000 pounds, and the other trim levels can pull up to 5,000 pounds. Typical for a Subaru, the Ascent is all-wheel drive, and offers enough ground clearance to head out for some minor off-roading excursions. Assisting when off-road is hill-descent mode which helps downhill control, and X-Mode to boost traction. Once inside the Ascent, you will see nicely appointed trim and styling. The Ascent Base comes with a second-row bench seat, but all other trims offer a no-cost choice of bench or captain’s chairs. There’s plenty of legroom. The controls for adjusting rear climate settings are simple and convenient. There are USB ports for plugging in chargers, and even a 110-volt outlet. A panoramic moonroof is available on the Premium and Limited, and it comes standard on the Touring. The foldaway third row is slightly elevated, creating theater-style seating. Third-row space is limited (common to the segment), but it can be useful for tweens and teens in a pinch. Passengers will find that the grab handles mounted on top of the second-row captain’s chairs make getting out of the third row easier. Combined with the performance and safety features, is some very cool technology. WiFi that can support up to eight devices can keep all your passengers happy on long trips. Apple CarPlay and Android Auto are 2 more cool options that allow you to play all your favorite music. A navigation system that features over the air updates to make sure your maps are always current. We invite you to the Olympia Auto Mall to test drive the newest offering from Subaru…The 2019 Ascent is the largest SUV (larger than the Toyota Highlander) the manufacturer has produced and is a winner right out of the gate. We look forward to seeing you soon.